What do Francis Bacon’s “Three Studies for Figures at the Base of a Crucifixion” and the ’50s sci-fi cheapie IT! THE TERROR FROM BEYOND SPACE have in common? Die-hard fans of Ridley Scott’s ALIEN know that the latter was one of the many influences screenwriter Dan O’Bannon pulled from when he first conceived the film, and now Alexandre O. Philippe’s documentary MEMORY reveals what the former work of art—and a lot more—had to do with the 40-year-old and endlessly esteemed space shocker. MEMORY, a world premiere at the current Sundance Film Festival, is Philippe’s follow-up to his much-admired documentary 78/52, which delved into Alfred Hitchcock’s PSYCHO in general and the shower scene in particular (see review here). Like PSYCHO, ALIEN has become a classic in toto but is also legendary for one particular scene of violence: that moment when the infant xenomorph punches out of Kane’s chest, splattering the rest of the Nostromo crew with viscera before scuttling off to evolve into a human-sized threat. As MEMORY reveals, what began as a simple story challenge—how to get the nascent creature onto the spaceship—became the product of an amalgam of sources ranging from vintage horror comics to Bacon’s triptych to stirrings in the deepest parts of the subconscious. Philippe goes after big psychological and mythological game in MEMORY, and that’s evident from the opening scene. It’s set at the Temple of Apollo in Delphi, Greece on May 25, 1979 (ALIEN’s release date), and depicts the awakening of the Furies from Greek legend, whom the filmmaker sees as one key to understanding the movie’s long-lasting grip on the popular imagination. From there, he sorts through O’Bannon’s background, unearthing all manner of clues to the ways the writer’s psyche and physical state (he suffered from an intestinal condition called Crohn’s disease that led to his death in 2009) metaphorically bled into a script that was started under the title MEMORY, later became STAR BEAST and was eventually dubbed ALIEN. In additional to revelatory recollections by O’Bannon’s wife Diane, Philippe shares glimpses of marvelous ephemera such as a Poverty board game O’Bannon once created. He also reproduces script pages of many various drafts, the different character names on view (one features protagonists named Faust and Hunter) testifying to the lengthy development hell ALIEN underwent. As MEMORY further elucidates, among the project’s problems was a studio that didn’t believe in O’Bannon’s more outré ambitions for it. At one point, legendary Swiss artist/concept designer H.R. Giger was fired and original director Walter Hill quit, and it was only after O’Bannon showed new helmer Scott the Necronomicon that Giger was brought back on board. Stories such as these may be familiar to some viewers from past chronicles of ALIEN’s production, and at times there’s an assumption of familiarity with genre-history arcana, as when “Jodorowsky” and his aborted DUNE adaptation are discussed without backgrounding. 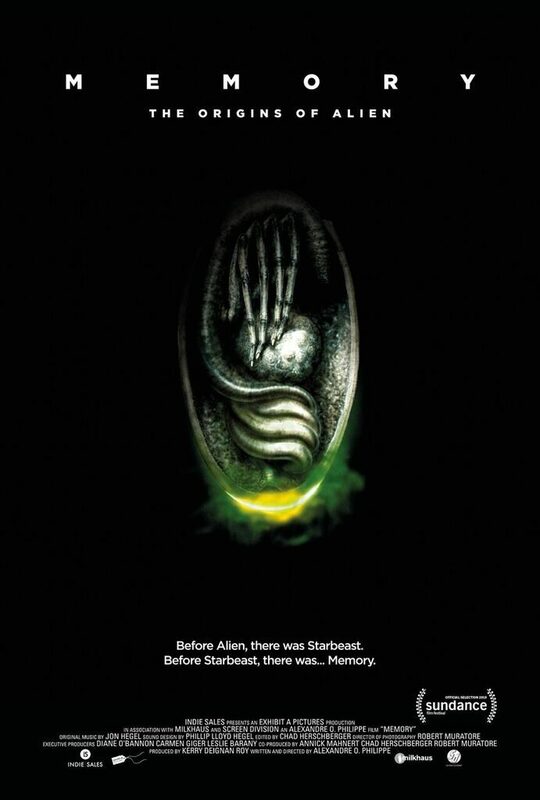 What makes them meaningful is that Philippe keeps the anecdotal material tied to a deeper examination of the personalities of ALIEN’s prime movers, and how and why the movie resonated so strongly at the time, and continues to do so. MEMORY is not a simple making-of, but a visual work of cinema scholarship that has a lot to offer for both casual viewers and rabid devotees of ALIEN. As opposed to 78/52, in which we heard from a slew of current fright filmmakers and watched them watch PSYCHO (appropriate for a movie suffused in voyeurism), MEMORY brings together a smaller but well-selected group of auteurs and screen scholars to help dissect ALIEN and its ongoing appeal. (Not all of them made the cut; the credits reveal that William Lustig and Yoshihiro Nishimura are among those whose observations may wait for the disc supplements.) Several of the film’s key cast and crew are on hand to share valuable first-hand observations of the genesis; Scott and Sigourney Weaver are absent, though the former is repped by brief vintage interview footage, and attention is paid to the details of his craft—the way he used composition to express the relationships between the crew, for example. Some might miss a celebration of Weaver’s Ripley as a trendsetting action heroine, but that’s a subject that has been given its due many times elsewhere. In unpacking ALIEN, Philippe is more concerned with the alien itself, and he takes us on a fascinating tour of the reasons why this particular beastie continues to prey on so many of us.